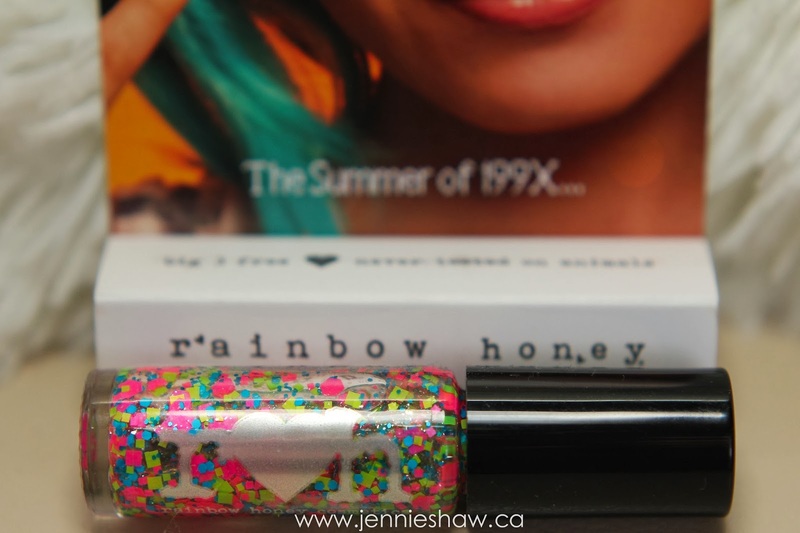 jennie's nails and tales: the nail files: birthday mani! Yahoo!! It's time for the nail files! Just this week (three days ago, to be exact) I received my first "complimentary polish for an honest review," which pretty much made my life. Side Note: When Nail Polish Canada contacted me last month to do a review, I nearly lost my mind because it (a) made me feel awesome and (b) it meant I'd get sample polishes!! Ha! I got five to review (eeeee! ), which you'll get to see when I post my formal review in a couple of weeks, but one polish was so amazing, SO INCREDIBLE that I was all: THIS MUST BE IN MY BIRTHDAY MANICURE. And you know what? My birthday's on Monday, so that worked out perfectly. Yes, that means I'm an almost-Christmas baby, so although you were probably expecting another holiday manicure this week, you get a birthday one instead. TRICKED YOU! Hahaha! It's called magic cake and it's amaaaaaazing. I mean, not only does it look like vanilla sprinkle cake (making it super birthday-mani-appropriate) but it's also a bit like Saved By The Bell in a bottle! Haha! Pinky: Two coats of Warhol Wannabe. Ring and Middle: Two coats of Paper Mache and then one thick coat of magic cake, applied with a flat nail art brush because otherwise, the confetti gets all glooped together (this is not specific to this polish, but to all big glitter/sparkle/confetti polish). 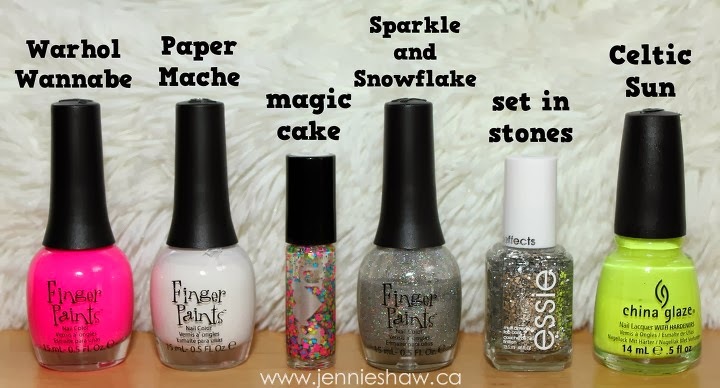 Pointer: One coat of Sparkle and Snowflake, followed by two coats of set in stones. Thumb: Two coats of Paper Mache and then one coat of Celtic Sun. I freaking loooooooooooove this polish, guys. It's the funnest polish EVAAAAAAAA! It makes me want to draw out the letters of one word in each sentaaaaaaance! Haha! But seriously, it's the best confetti colour combo I've seen yet and just looking at it makes me happy, therefore making it the perfect birthday polish! YAY! And because next Friday is after Christmas, Merry Christmas and Happy Holidays! Okay, yes these are by far my favorite ones you have done!! It's so BRIGHT! Love it! Happy happy birthday!!!!! These are great. I think people are afraid to use colors like these in Winter, so I really like that you did them these colors. Jennnnnnieeee - I just threw my hair into a side ponytail with a big scrunchie, tied my tshirt up with a neon shirt clip, and loaded up my Walkman with the latest Milli-Vanilli cassette tape. Saved By The Bell in a bottle is THE BEST description ever. Congrats on being asked to review this - I know that's an awesome feeling! What an amazing polish to receive - it's so unique and fun. And I'd like to steal it from you, please. I love the mani you put together to go with the new polish - It all looks so good together! I love this look and the neon colors. Gorgeous! Love everything about it & it definitely screams "Go shorty, it's your birfday!" ;) Happy Birthday & Happy Holidays! Happy, happy birthday...to yoooouuuuu!!! It's like funfetti on your nails!! OMG this is the best mani ever!! You're so right! Such a perfect bday mani AND it's SO saved by the bell in a bottle!!! Happy happy birthday sweet girl!! I hope it's amazing!!! I love this mani!!! I have got to get my hands on that polish! Ok, once again another week of pretty nails. I love them! I love the colors too! Too cute :) Happy holidays!